Displaying a deep garnet color, Opus One opens with aromas of cinnamon stick and black pepper. On the palate, the wine opens to reveal flavors of blackberry pie, plum preserves, mulberries and fragrant earthiness. 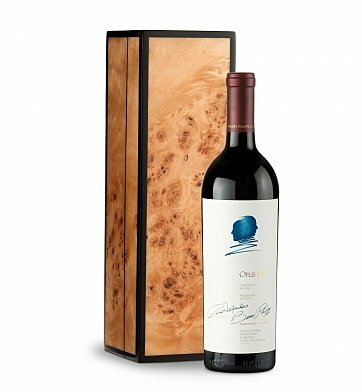 Opus One is offered in our exclusive lacquered Burlwood keepsake box. Burlwood's remarkable grain give each piece its own true identity, making it an alluring gift. One bottle of Opus One. Keepsake Burl Wood Lacquered Box. Wine Card Containing Production & Tasting Notes and Cellaring Information. This fine wine gift is presented in our signature lacquered Burlwood box. A complimentary note card bearing your personal message or greeting is included with your gift. Opus One Grand Reveal is a hand delivered gift. These gifts are delivered by one of our local design centers located throughout the United States and Canada. Same day delivery is available for most gifts when ordered before the cutoff time. The cutoff time for Opus One Grand Reveal is 2 PM in the recipient's time zone. Featuring Opus One, the pride of Robert Mondavi & Philippe de Rothschild. Arrives presentation-ready in our signature lacquered Burl Wood gift box. Includes a complimentary attached card bearing your personal gift message.